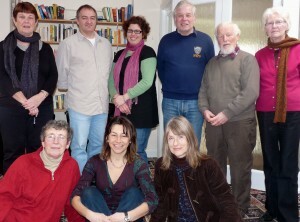 Honiton meeting (of our recently founded East Devon Green Party) went well on Saturday, with a few new faces, lovely to see & very welcome especially in Honiton where there doesn’t seem to be much green going on (on the surface!). After our normal business, we started chatting about policies and issues which were of concern to the group. This included supermarkets, coastal erosion, the unitary authority issue and local transport. If you couldn’t make it to the meeting or would like to continue our discussion here, simply add your comment below. It would be great to talk more about any of these four issues, so we can move further towards our own (East Devon) policy for them. We’ve decided to get out and about on Saturday and do our first stall – in Sidmouth. Sharon H, Michele, Ana and myself will be there (on Sat 20th) telling everyone about the new East Devon Green Party and hoping to sign up a few new members. Let us know if you can pop along – exact spot not 100% but we’re thinking of up near the co-op. 10am – 12 midday. Add a comment below if you can come over and help. I think the District Council is going to have a lot of headaches when the new recycling arrangements start next month. There are plenty of people who have never used the green box scheme, for a start. Just as an example, a family near me fill two wheelie bins per week, and do no recycling. Even if they start using the green box scheme, they are unlikely to cut their landfill waste down to a quarter of what it is now. Perhaps there is a role for the local Green party to help people get used to the new system while promoting themselves as Greens at the same time? I don’t know how this would work, but maybe through liaison with the council, EDGP could offer a voluntary helpline? I am sorry I can’t offer to do this myself because I won’t be here. But it seems like an idea worth mentioning. Help! East Devon is being swamped by the onslaught of large chain supermarkets crashing into the sustainable living goals that many individuals and communities now have. Ottery St Mary (Transition Town) is threatened with a Sainsbury’s or a Tesco (cynically speaking both!). EDDC are making their decision in public on Tuesday 9th March, venue to be decided. It’s not too late to write to Councillors. Please come to the meeting, we need to show our…..concern. Hi Christine – thanks for your comment on recycling. I’ve been meaning to blog about this actually as the article on the front page of the Midweek Herald two weeks ago really annoyed me with such negative reporting of the new recycling initiative. The local press should support this move 100% and yes there will be headaches to start with, but things must change. Last week’s Midweek Herald article was a bit better with details of what changes are happening – see page 6 or the online version. I do, however understand your point about public awareness, support and advice as I have family members and neighbours who are not really sure what they’re supposed to be doing (although I would argue that each individual also has a responsibility to find out what they should be doing). I personally found the leaflet the council sent with the food bin very useful and I know they are doing roadshows around East Devon to show people how it’s all done. I don’t think it’s really the place of a political party to run the council’s liaison with the public BUT I will contact them and ask them to either leave us a comment or give us some more info about how they can offer advice etc. I do have a question for them on whether metal bottle tops can go in with cans actually! Thanks again Christine – great comment. Keep them coming! Update on proposed Sainsbury/Tesco stores for Ottery St Mary. EDDC have still not announced the public meeting date and venue for the decision on these proposals. There is still time to lobby/write councillors/newspapers. Please visit the Green Party campaign stall outside the Community Market (The Institue) OSM in the morning on Saturday 27th March and come to the Green Party meeting at The Institute on Wednesday 31st March at 7.30pm. Hi Ana – Geoff suggested putting the stall outside Boots as it would be busier??? Previous PostPrevious Who are the Parliamentary General Election Candidates for East Devon in 2010 ?